Danfoss Drives exhibited at the Drives & Controls Exhibition at the NEC, Birmingham in April 2014. The PIF team had the opportunity to interview their Area Sales Manager Dean Russell about the innovative inverter drives and systems they were exhibiting. Dean Russell demonstrated a new product launch from Danfoss; the innovative and unique VLT FlexConcept inverter drive. The VLT FlexConcept is a fully integrated drive solution which utilises the OneGearConcept, allowing plant owners to realise maximum efficiency, adhere to stringent hygienic standards and benefit from significant cost reductions in their plants’ operations. Dean Russell states the new inverter drive technology is a ‘market-leading’ product, which can be argued to be pushing the hygienic market forward. He argues the VLT FlexConcept actually ‘future proofs’ the equipment on site and brings equipment in line with new energy saving specifications and standards put forward by governments. The VLT FlexConcept pushes the boundaries of Food & Beverage applications and the certification that goes with it! What is the VLT FlexConcept? FlexConcept is a unique solution that provides users with a high level of flexibility in the choice of components during plant retrofit and upgrade. The FlexConcept solution is equally efficient in centralised and decentralised production facilities and in dry, wet or aseptic areas. What is the OneGearDrive concept? The VLT OneGearDrive is a highly efficient permanent-magnet three-phase synchronous motor coupled to an optimised bevel gear box. The drive can achieve up to 89% efficiency and high torque and already exceeds the IE4 Super Premium Efficiency class, in a compact motor frame. The OneGearDrive has a uniform operating concept, identical functional principle and easy connection function featuring axels made out of stainless steel. These features reduce installation time, service requirements and maintenance costs significantly. The VLT FlexConcept allows for reductions in the number of model variants installed in plants by 70%, whilst still allowing plant owners the ultimate flexibility and choice over motors and frequency converter technology. This is a huge advantage in large plants, as stocking costs can be reduced significantly. The IP66 or the IP69K enclosure design allows the motor to withstand typical SIP or CIP cleaning processes, including high-pressure cleaning. For applications with especially stringent hygiene requirements (e.g. 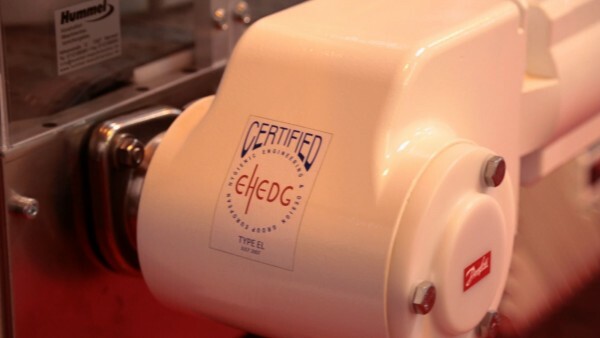 the aseptic filling of sensitive products), the units are available in an EHEDG certified version. Danfoss VLT® Drives, part of the Power Electronics division, has been mass producing frequency converters for over 45 years and operate in 120 countries globally. Danfoss develops dedicated drive solutions, available in power range up to 1.4MW, for a wide variety of applications in strategic business areas (water & waste water, chemical, heating & ventilation, refrigeration, food & beverage and general industry).